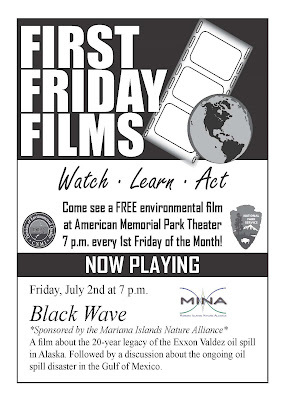 SAIPAN – Every first Friday of the month, starting in July, a free environmental film will be shown to the community at American Memorial Park Theater. “First Friday Films” was inspired by the exceptional turnout and response to the films played during Environmental Awareness Month in April. Hundreds of people came out to see the Lorax, HOME and The End of the Line. The overwhelmingly positive reaction to the films illustrated the power of cinema to educate and inspire a wide variety of people. Each month a film will represent a month-long theme of activities aimed at inspiring the community to become actively involved and make environmentally friendly choices. 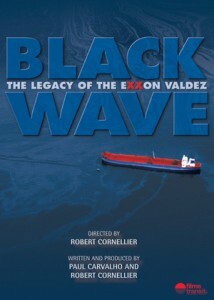 Sponsored by the Mariana Islands Nature Alliance (MINA), the first film to be featured on Friday, July 2nd at 7 p.m. is Black Wave, a documentary about the 20-year legacy of the Exxon Valdez oil spill. In the early hours of March 24th 1989 the Exxon Valdez oil supertanker ran aground in Alaska and discharged millions of gallons of crude oil into sensitive Artic waters. The incident became the biggest environmental catastrophe in North American history. or post on your blog. Given the recent oil spill disaster in the Gulf of Mexico and the allowance of further drilling by the Obama administration, “Black Wave” is a timely and relevant feature that will educate the community about the risks associated with offshore oil exploration. Following the film, local oil spill responders will discuss the Gulf of Mexico spill and the response plans in place for the CNMI. “First Fridays” is coordinated through a partnership between the Division of Environmental Quality and American Memorial Park, with the generous support of organizations such as MINA. Click here to download the flyer to post at your business or on your webite or blog!